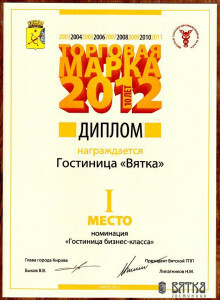 The Vyatka Hotel received a regular first place in the contest “Trade Mark of the Year”. A solemn awarding of the “Trade Mark of the Year 2012” city contests participants was held on November, 30th. 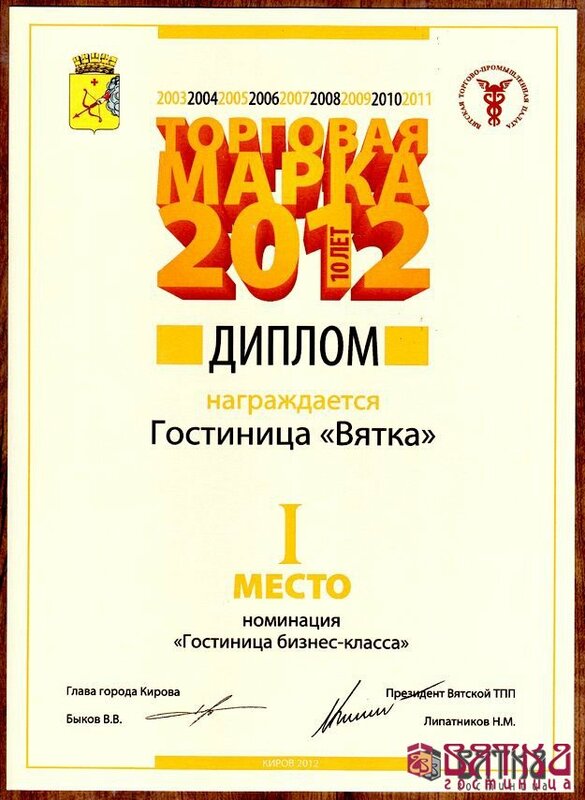 The Vyatka hotel again became the best in the “Hotel of Business –Class” category. The director of the hotel was awarded the Diploma for the First place on behalf of the Head of the City Administration V.V.Bykov and the president of the Vyatka Trade-Industrial chamber of Kirov region N.M.Lipatnikov. The Vyatka hotel took part in this contest for the fourth time. The victory in this contest proves the high quality service offered by the hotel, new progressive technologies, and the fact that the administration and the staff put the prestige of the hotel and clients’ interests on the first place. The aim of the City contest “Trade Mark of the Year” is to define the leaders among retailers, companies of catering and public services.